In the 1880’s many German born emigrants were lured to America by the promise of a better life with religious freedom and to the Newton area by the railroad’s offer of land at a fair price. Among them were several German speaking Lutheran Christians settling and homesteading in and around Newton. These early Lutherans began meeting together for worship under guidance of a nearby Lutheran pastor, the Rev. J.H.F. Hoyer of Spring Valley near Canton, Kansas. These cottage meetings continued as Rev. Hoyer’s time permitted from 1883 to 1886. 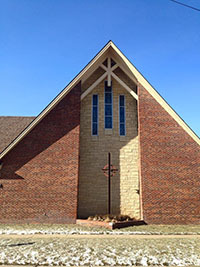 Feeling the need for a more permanent church home, this Christian fellowship organized the first Lutheran congregation in Newton on March 22, 1886, naming it Zion Evangelical Church of Newton, Kansas. The charter members were Henry Hannemann, August Huebert, Fred Spudig, Henry Trier, Chris Tohst, and Fred Hartenberger. Construction of the first church at the present site was soon begun and was dedicated in September of 1886. The first pastor of Zion was the Rev. J.V. Kauffeld, who served from 1887 to 1891. 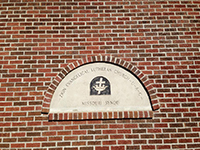 Three years after Zion’s formation, it became a member of what is now known as the Lutheran Church – Missouri Synod. The first church served Zion’s congregation from 1886 to 1903 as did four other pastors: The Rev. J.H. Hamm (1891-1896), Rev. A. Grambauer (1896-1898), Rev. C.W. Tews (1898-1902), and Rev. J.W. Dukewits (1902-1912). Concerned with the Christian instruction of their children, Zion also maintained a Christian Day School from it’s beginning. The early Pastors doubled as schoolteachers. The second church built by Zion was dedicated August 9, 1903 and the old church was occupied by the day school. This second church is still in use today having survived renovation, a face-lift, and two additions. This second church housed Zion’s Sanctuary for 64 years and echoed the sermons of 5 pastors. The Rev. J.W. Dukewits (1902-1912), Rev. W.C. Droegemueller (1912-1941), Rev. E.H. Wilms (1941-1956), Rev. L.E. Vogel (1957-1962), and Rev. R.L. Jackson (1963-1969). Many changes occurred at Zion during those years. German was slowly replaced by English. 1946 sees the last regular German service and a Sunday School is started for the children. The men organize the Men’s Club, a Walther League group is started, and a Ruth Guild is born. In 1929 the church is remodeled and brick facing added. 1947 saw the close of the Day School due to a shortage of trained Christian teachers. The first Vacation Bible School is held in 1948. In 1955 a new education wing is dedicated to house an expanding Sunday School. A new parsonage is built in 1959 to replace the old one, which was moved to church property in 1895. The post war period was a growth period for Zion and the need for expansion became evident. On July 31, 1966, through the dedication of the faithful of Zion and to the Glory of our Lord, our present sanctuary was dedicated. Serving as spiritual leaders since that time have been the Rev. R.L. Jackson (1963-1969), Rev. R.J. Mueller (1969-1972), Rev. David G. Jeske (1974-1980), Rev. David Johns (1981-1984), Rev. Louis Kieschnick (1985-1990), Rev. Ronald Gloe (1991 to 2002), Rev. Richard Andrus (2004-2007), Rev. Jerry Powers (2007-2009) and Rev. Aaron Filipek (2009–present). These latest years at Zion have been not unlike those of our land. We have had some troubled days and shining hours. We have seen our longest vacancy, during which a second Lutheran congregation was formed in Newton, resulting in a loss of membership at Zion. In 1975 Zion sponsored and ministered to 29 Vietnamese refugees. From 1977 to 1980, Zion participated in the DCE (Director of Christian Education) intern program of Concordia Teachers College, Seward Nebraska by contributing to and benefiting from the training of student interns. Serving as DCE interns were: John Paulus, David Bliss, and Mark Hess. The mid-week program was expanded in 1985 into the Youth Club Program. A Christian Pre-School was started in 1988 under the direction of Vivian Neimann and continues today. The first full-time Director of Christian Education (DCE), Corrine Young, was called in 1989 and served during the call of Rev. Louis Kieschnick. The entire membership of Zion was devastated by the slow decline and death of Pastor “Nick” Kieschnick. Yet at that same time, strengthened and heartened by his deep faith in the Gospel and love for our Lord Jesus Christ. Then, still recovering, Zion’s congregation was stunned by the sudden death of their DCE, Corrine Young. Zion once again began the healing process under the care of Pastor Ron Gloe and in time called a new DCE, Janette Reinke. During Pastor Gloe’s time at Zion the congregation became aware of a need for a larger gathering space. With the Lord’s guidance the Parish Activity Center was built and many members participated in the effort. In 2002 Pastor Gloe accepted a call to a Lutheran church in Arizona. After a pastoral vacancy of two years, Reverend Richard Andrus accepted the call and was installed as Pastor of Zion on August 29, 2004. Pastor Andrus was passionate about reaching out to those who did not know about Jesus. In his years at Zion he began the “Zion Block Party” as an outreach to neighborhood children. In addition to the block party, Pastor Andrus and several other congregation members led the Peacemaker Bible study geared toward resolving personal conflict. This allowed Zion to undergo a process of change at Zion and redirection for the congregation. 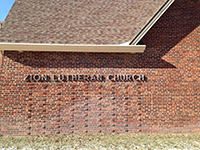 In September of 2007, Zion received an interim pastor, Rev. Jerry Powers. Upon his arrival he made one of his top priorities the strengthening of Zion’s leadership through the Elders and Church Council. During his two years of service, he served Zion as a strong facilitator, in a loving and caring way. Under his care and guidance Zion was led to call our current pastor, Rev. Aaron Filipek. Pastor Aaron Filipek was installed as our sole pastor on Sunday, September 13, 2009. During his pastorate, the members of Zion have enjoyed hearing God’s message of salvation for us in Jesus Christ through the pure preaching of the Gospel, the historic Lutheran liturgy, and the reception of the Sacraments (Baptism, Holy Communion, and Confession and Absolution), as well as engaging and informative Bible Studies that are Christ centered and cross focused. The saints of Zion Lutheran Church, have been blessed to receive and proclaim Jesus Christ crucified and risen for the forgiveness of sins for over 125 years. And we look forward to receiving and proclaiming Jesus here in Newton, KS for the next 125 years and beyond.